Scrumpy & Western website. Made In Somerset from cider! Twurzel band page. 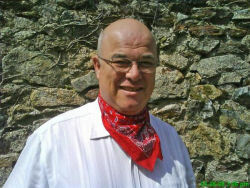 Twurzel is the alter-ego of The Cutlers of Cornwall's frontman Greg Woods. He writers "As a small child, I listened with awe at the late and great Adge Cutler. They were at Yate carnival in the mid 60's, perched on an agricultural trailer, I was placed on the front of the trailer at their feet, and never moved until they finished. It helped form my love for music, though at first life took me in another direction. I started my formal training with the school band at Stanshawe Court Primary school, then at 15 moved on to band school with Junior leaders regiment Royal Armoured Corps, from there I was posted to the band of the 13th 18th Royal Hussars, and through this band attended "Kneller Hall", The Royal Military School of Music. On my return to the band I was posted to Hohne in Germany, that is where I heard Shag Connors and the Carrot Crunchers; I remember it as a cracking night. I then became a tuba player in a real German Ommpa band, and went on to play Dixie, Pit Orchestra, Rock and Roll, Heavy rock, indeed, if was musical, I had a go at it, ending (so I thought) as the musical director of Carn Brea Brass band. Having been out of music for many years, I met Russ Holland, we started talking about Adge Cutler, he played banjo, I played tuba, we added Mike on accordian, and The Cornish Wurzells were born. Our first gig was at Madron, and we played at Jethro's Club, and supported him at The Hall For Cornwall; we also played at the Falmouth Oyster Festival. 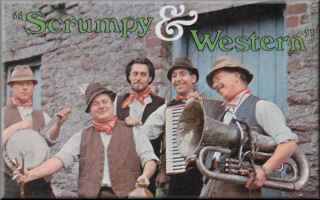 But as in life, Russ and I had different goals, Russ was happy to be a Wurzels tribute band; for myself, I believe that Scrumpy and Western music is still a babby and has a long way yet to travel. Adge wrote some great songs, and to this mix, I wanted to add some Cornish songs, and to bring new material to the stage, So I formed The Cutlers of Cornwall along with Dave Knightley on keyboards, and Martin Rose on Tuba. I became the frontman, and added piano accordian and banjo to the mix. I then started writing and arranging. Many of these new songs can be heard on the Cutlers' CD A Country Life. 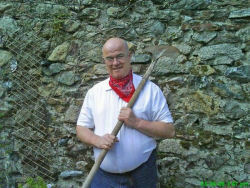 And now at the age of 50, I have decided to have a go at being a full-time musician. This is not easy. and not every venue can afford a three-piece band, this restricts the amount of work we can do. So for for daytime and early week engagements, with the help of The Cutlers of Cornwall, I have created a one man show called Twurzel." - Greg Woods for information received.